FLASH BACK: Rupununi flood in 2017. 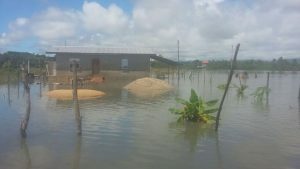 Director of the CDC, Lieutenant Colonel Kester Craig said the commission and the Region’s Democratic Council of Region Nine are monitoring the Takatu and Ireng rivers and the roadways. He the main aim of the visit is to locate deficiencies in the region’s preparedness and response capability and work towards enhancing them. The CDC Director encouraged residents to stock up on food supplies and water, medical supplies and other household items since most of the roadway is cut off. For the past four days, heavy rains caused flooding in Deep South which resulted in the Wardpao Bridge across the Rupununi River to be inaccessible to residents and vehicles. The road between communities of Katoonarib to Karaudarnauwa has been identified as the alternative route but it needs some work so that residents and vehicles can safely travel to their destinations.